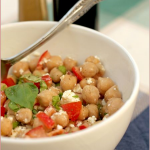 Watermelon, feta, olive & basil salad – and a BBQ event! Firstly, there were people here, people there, people EVERYWHERE! Can there be a better way to spend a summer afternoon? Sadly, I can’t invite ALL of you over to my house for a braai, but I can invite you to join me in celebrating South Africa’s National Braai Day again this year with my annual braai/BBQ event Braai, the Beloved Country – please scroll down below the recipe to see how to enter! Cut the watremelon flesh into bite-sized chunks (I removed most of the seeds but this is up to you). In a large bowl, toss together the watermelon, feta, olives and basil. 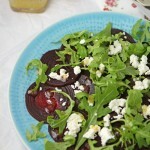 Whisk together the oil and vinegar and pour over the salad just before serving, tossing to coat everything. Add black pepper to taste. And now, on to how you can enter Braai the Beloved Country! I would love for you to share your favourite braai or BBQ recipes with me – it can be meat, fish, vegetables, breads, stews – in fact anything that you can cook over an outdoor fire or grill, South African inspired or not. Then on 24 September, I will post a round-up of all the recipes in a big celebration of summery outdoor cooking. And as it’s an annual event, I will even let you submit favourite recipes you have posted previously in 2011 – as long as you repost them as a new post between now and the end of September 2011. 1. Post a braai/barbecue recipe between now and 23 September. Your choice of recipes is really broad – meat, chicken, fish, vegetables, breads – as long as you cooked it over coals or an outdoor grill. 2. You must link to this announcement in your post. 3. Multiple recipes and recipes submitted to other events are permitted. 4. Recipes from your 2011 archives can be accepted but you MUST re-post them in a new post dated between 22 August and 23 September 2011, and link to this announcement. 5. Use of the Braai, the Beloved Country logo is optional but would be nice. Ask me if you want code for a badge in your sidebar. 6. A photo is preferred, but not essential. 7. Send me an e-mail (emailcooksister AT gmail DOT com) with BRAAI in the subject line and containing: your name; your blog name; the recipe title; and the URL of the post that the recipe appeared in. Attach a photo if you can. I will post a roundup of all the recipes on 24 September to coincide with National Braai Day. I really need some one to invite me to South African Braai. Please? Please? I’ll do the dishes after wards 😛 ha ha Thank you for enlightening me on the differences. Feta, olive, water melon – my all time favorite salad ingredients. But fruity vinegar? should try that! I was writing about the difference between a braai and a barbecue the other day and completely missed those two major points – the weather factor and the amount of meat! I’ll be looking out my braai recipes to enter – got to support National Braai Day! To me salad is tyhe most important aspect of a great “braai”. I love this salad. I use red onion in mine but can see black olives would be nice too. I’ve always thought the combination of watermelon & feta sounded heavenly, yet I’ve never had this particular salad. Clearly time to remedy that particular situation – and what better time than National Braai Day! A lovely event! That salad looks so appetizing and refreshing. A wonderful combination! I am going to get my wife to make this salad – it looks delicious! I am a Saffa who has married into a welsh family – have taught them how to cook outdoors on the braai and not burn the meat! Very interesting looking salad. At a braai we normally have either potato, carrot or greek salad. Saw an interesting discussion on the “WegSleep” Facebook page the other day. The question was, “Do you make vegetables when you camp?” Most people say that they mainly braai and do potjie when they camp, while one guy said that Beef and lamb are meat and chicken and pork are vegetables. Yes – THATS what I call a braai, lots of people, lots of meat, salads, cold wine, cold beer….its not so much a barbeque – more a way of life! I am always amazed at how Nigella keeps getting credited for recipes that were around whilst she was still a journalist who never boiled an egg. I first had this salad in Plett at least 6-7 years ago, and a friend who was with me said she’d had it some time before that. It is delicious, but should not be made too long in advance as it has a tendency to become watery from the fruit. The paper plates! Thank the Lord for them. Your braai looks like it was so much of fun – what a lovely garden you have. In london, nogal.What a cool idea re Braai the Beloved Country…now, we *still* need to get a new grill and we’re in business. The old one (read cheapie fake webber since husb left his real deal one in Holland), FLEW off the roof of a friend’s balcony in Sea Point. Said friend, did not replace. Thankfully. Now to get a real one. 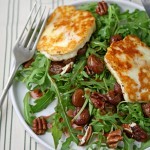 Love the salad- bet the olives add wonderful contrast of flavour. At a braai we normally have either potato, carrot or greek salad…I am always amazed at how Nigella keeps getting credited for recipes that were around whilst she was still a journalist who never boiled an egg. Beautiful photos! I also developed an obsession and made my first watermelon salad last summer…Saw an interesting discussion on the “WegSleep” Facebook page the other day.. Thankfully. Now to get a real one. I’ve never seen olives included in a feta & watermelon salad before… I’m intrigued! This post makes me nostalgic as joined in last year…where does time go? I’ll certainly try to participate again although probably will barbecue in rainy UK rather than on return to steamy Dubai! 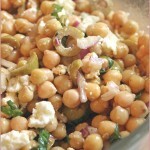 I have made a similar salad a few times – so simple and refreshing for summer (!) weather. Goes really well for BBQed lamb as well. I’m a new visitor to your blog so I am not really sure what is allowed and what not so excuse me if I am overstepping the line. In the spirit of interesting salads I would like to share with you a recipe that my sister gave me of an equally strange and suprisingly refresing salad a few summers ago and it is just as great with a braai. And really easy. Mix together 1 medium papaya (cubed), one punnet of strawberries (quatered), 100g feta (crumbed) and 60g chopped pistachios. For the dressing mix together 125ml sweet chilli sause and 15ml lemon juice and dress salad gently. Serve immediately and enjoy! 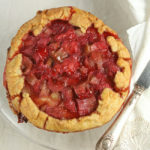 I did not add this: I love your blog, the photo’s and the recipes, I find great inspiration in it all. “Jong my mond water sommer nou vir daai braaivlei” Wonderful! It looks like everyone had a great time. Thanks for the excellent recipe. I cannot wait to try it. The famous lamb sosaties look wonderful and I tried the WATERMELON, FETA CHEESE, BLACK OLIVE AND BASIL SALAD tonight. The first time I made that salad for people I got the same quizzical looks to start- and then everyone just kept eating it. Last time we even put a couple of the slices of watermelon on the bbq before adding- it made for some interesting textures. Thanks for this watermelon, feta cheese, black olive and basil salad. It sounds like a great summertime treat. Oh wow, your watermelon event such a fantastic. In your post each and every enjoying a lot.Food pictures looking awesome! I like your fabulous post. Thanks for sharing your sweet event pictures.